To request this item, call the Montgomery County Customer Service Center at 311 (or 240-777-0311). This item is available only by phone order. When you report a broken cart, we will schedule a repair appointment for you. On the day of your appointment, leave your empty cart at the curb for our staff. You do not need to be at home. Do you already have a wheeled cart? We issue only one cart per house. If your weekly paper recyclables exceed the cart capacity, please call us for assistance. What can you recycle in a wheeled paper recycling cart? These wheeled carts are for paper recycling only. Use blue bins for setting out cans, bottles, and jars for curbside recycling collection. May I order a cart in a color other than blue? 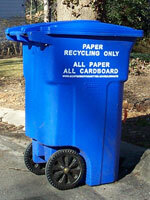 Sorry, we do not offer wheeled carts for paper recycling in alternate colors.